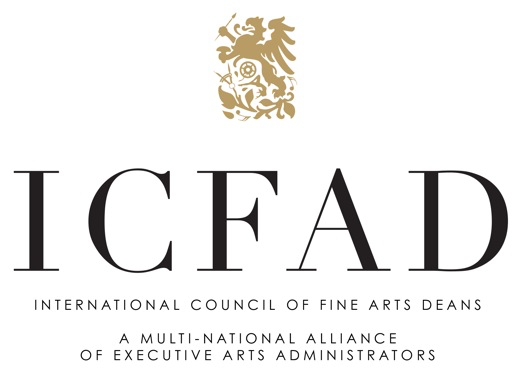 The International Council of Fine Arts Deans (ICFAD) is a multinational alliance of academic arts administrators representing institutions of higher education. Beyond being the provider of professional development, ICFAD facilitates forums for the exchange of ideas, information and issues of common concern for arts deans. ICFAD commits to its role as an influential advocate for the arts. ICFAD will fully align its operational structure with the mission, substantially increase its value to all members and significantly raise its profile in the United States. 1.3 NON-PROFIT CHARACTER: ICFAD is a non-profit organization. 1.4 RESTRICTED ACTIVITIES: ICFAD shall not lobby to influence legislation other than as an insubstantial part of its activities and shall not engage in propaganda. Membership in the International Council of Fine Arts Deans shall be open to post-secondary institutions that foster the practice and/or study of the creative arts. ICFAD does not discriminate against any institution or person on the basis of race, gender, religion, national origin, age, sexuality or disability. 2.1 INSTITUTIONAL MEMBERSHIP: This membership is held by the chief executive arts administrator of the academic unit or a designee on behalf of the institution. This member would receive full benefits of the organization and would hold the voting privileges of the unit. Recognizing that some institutions organize the arts disciplines into separate schools or colleges, with each reporting directly to the Chief Academic Officer, ICFAD also invites membership from institutions that have other administrative structures. In instances where institutions have more than one institutional representative, each Institutional Representative shall have one vote. When not in attendance, an Institutional Representative may designate a proxy from the institution to cast the vote for the institution. In special circumstances a proxy ballot from an Institutional Representative may be cast upon notification to the Executive Director at least fourteen (14) days prior to the date of the annual meeting. 2.2 ASSOCIATE MEMBERSHIP: This membership is held by additional academic arts administrators on behalf of the institution whose unit holds an Institutional Membership. The Associate member would receive full benefits of the organization, but would not have voting privileges. There would be no limit to the number of Associate members from any unit holding Institutional Membership. The Board of Directors may develop reciprocity agreements in the form of Associate Membership to institutions that belong to professional arts organizations that have a current "Memorandum of Cooperation" with ICFAD. 2.3 AFFILIATE MEMBERSHIP: The Board of Trustees of ICFAD may, by formal action, grant "affiliate" membership to individuals who do not meet the other membership criteria but for whom membership is deemed appropriate and beneficial to the organization by Board decision. Beneficial criteria may include professional expertise not readily available among the existing membership, officers in arts-support organizations, and those bringing to the Council other areas of understanding that will assist ICFAD in achieving its mission. Affiliate members would receive full benefits of the organization, except for voting privileges." 2.4 EMERITUS RECOGNITION: Emeritus designation is awarded by the Board to ICFAD members, who have served as deans, associate deans, or assistant deans, and have retired from higher education, or plan to retire from higher education within the year, having provided leadership for ICFAD or having been a long-time member. Emeritus Recognition shall have the same rights, privileges and obligations as Associate members. 2.5 HONORARY MEMBERSHIP: With the agreement of the nominee, the Board of Directors may bestow Honorary membership to distinguished individuals who have made extraordinary contributions to the arts or who are uniquely positioned to advocate for the goals of the organization. Honorary members shall have the same rights, privileges, and obligations as Associate members. 2.6 DISTINGUISHED SERVICE: Distinguished Service designation is awarded by the Board to ICFAD members, who have served as deans, associate deans, or assistant deans, and have returned to the faculty, or transitioned to Provost or President position, having provided leadership for ICFAD or having been a long-time member. Distinguished Service recognition shall have the same rights, privileges and obligations as Associate members. 3.1. QUALIFICATIONS: Only Institutional Member Representatives shall be eligible for election as an officer. All officers must have achieved a notable record of service in ICFAD as a member-at-large of the Board of Directors in order to hold an elected office. The officers of ICFAD are President, Past President, President-Elect, Secretary and Treasurer. The President is the principal representative and spokesperson for ICFAD. The President, with the concurrence of the Executive Committee, shall have the authority to appoint the members of the committees, determine the chairs of all committees, articulate the charge to committees, and specify the time frame for review of committees. The President shall have the responsibility to ensure that the membership is informed regarding issues of common interest. The President serves as the chair of the Executive Committee, and co-chair of the annual conference team. The term of office is two (2) years, beginning at the close of the annual conference, which concludes the term of the outgoing president. The Past President (1) fulfills general duties to provide continuity from one administration to the next, (2) serves as chair of the Nominating Committee, (3) serves as co-chair of the annual conference team, and (4) oversees any by-law revisions recommended by the Board. The Past President's term begins immediately at the conclusion of his/her service as President and runs for one year. The President-Elect (1) serves as chair of the Nominating Committee, (2) serves as the co-chair of the annual conference team, and (3) oversees any by-law revisions recommended by the Board. The President-Elect serves in this office for one year immediately preceding assumption of the office of President. The secretary maintains the records of the Executive Committee including: (1) presenting the official minutes for all Executive Committee meetings, Board of Directors meetings and the general business meetings of the organization, (2) coordinating new membership recruitment efforts and (3) partnering with the Executive Director to secure conference sponsorships. The secretary will serve for a period of two (2) years. The term of the secretary and the term of a new president will not begin in the same year. The office of Secretary will place the Secretary in position to become the automatic nominee of the Nominating Committee for the office of the President-Elect, assuming that s/he has served as Secretary with distinction and is a member in good standing. The treasurer (1) monitors the financial operations of the organization and (2) makes financial reports to the Board and to the membership at annual meetings. The treasurer is appointed by the President from among members of the Board of Directors who are in at least their second year of service. The treasurer serves a term of two years. The Parliamentarian will provide advice on parliamentary procedure based on Robert's Rules of Order Revised. The President shall appoint a Parliamentarian from among members of the Board of Directors who shall serve a two-year term concurrent with that of the President. 4.1 RESPONSIBILITIES: The Board is vested with the authority to exercise its best judgment as individuals on behalf of the organization. The Board shall (1) set the policy of the Council, (2) authorize the budget (including any fund-raising activities or jointly funded projects with outside organizations), (3) authorize all grant applications prior to submission, (4) approve date, location, and theme of conferences, (5) develop and/or endorse position statements on issues which come before ICFAD or in regard to concerns of the membership, (6) ensure that the membership is informed by appropriate officers of important trends, events and issues, (7) make recommendations for bylaws revisions, as needed, to the membership, and (8) authorize committees as it deems appropriate at any given time and establish procedures for periodic review of all such committees. The Board of Directors has sole fiduciary responsibility for the operation of ICFAD and all its committees. Each Director shall have one vote exercisable in person or by proxy. 4.2. STRUCTURE: The Board of Directors shall consist of the President, immediate Past-President (the first year of the President's term), the President-Elect (the second year of the President's term), Secretary, six members-at-large elected by the membership, one of whom will serve as Treasurer, and the Executive Director, functioning in a non-voting, ex-officio capacity. The Board shall review periodically its representation in relation to the composition of the membership. Elected directors shall serve a term of three years and may not stand for election for consecutive terms. Only Institutional Member Representatives shall be eligible for election as members of the Board of Directors. The Past President serves a one-year term and the President-Elect serves a one-year term on the Board while holding these offices. The Board shall hold an annual meeting and shall meet at such other times and places as the President shall determine. Reasonable notice shall be given. A majority of the Board shall constitute a quorum. The act or vote of the majority of the Directors present at a meeting at which a quorum is present shall be the act or vote of the Board unless the act or vote of a greater number is required by these Bylaws or by law. There shall be two general categories of committees: Standing Committees and Ad Hoc Committees. Unless otherwise specified, both the chair and the members will serve for a term of two years, renewable for one additional term. In exceptional cases the service may be extended further at the discretion of the President with the concurrence of the Executive Committee. 5.1. Standing Committees: Only Institutional Representatives may serve on Standing Committees. 5.1.A. The Executive Committee shall consist of the President, the immediate Past President (during the first year of the President's term), the President-Elect (during the second year of the President's term), the Secretary, the Treasurer, and the Executive Director, a non-voting, ex-officio member. The Executive Committee has oversight for the fiscal activities of the organization, oversees the fiscal management of the President and Executive Director, and establishes/manages the evaluation and compensation for the Executive Director (with approval from Board of Directors). 5.1.A.i. Quorum; Action by Majority: Three of the four members of the Executive Committee shall constitute a quorum. The act or vote of a majority of the members present at a meeting at which a quorum is present shall be the act or vote of the Executive Committee. The Executive Committee is authorized to act for the Council during the interim between meetings of the full Board. Minutes of such actions shall be reviewed by the full Board of Directors at its next scheduled meeting. 5.1.B. The Nominating Committee will consist of one representative elected by the membership and one representative appointed by the President, who shall serve staggered two-year terms. Only Institutional Member Representatives shall be eligible for election as members of the Nominating Committee. The Past President or President-elect will chair this committee. 5.1.B.i. Nominations: The Nominating Committee will be responsible for consulting broadly among the membership to identify candidates for vacant positions. The Nominating Committee is enjoined to consider international geography, cultural diversity and gender sensitivity when formulating a slate. A member of this committee may not be nominated for election. All nominations made by the membership shall be emailed to the Executive Director, who shall forward them to each member of the Nominating Committee. 5.1.C. The Conference Planning Committee membership will consist of members of the ICFAD Board of Directors and the host dean(s) for the next annual conference. 5.2. Ad Hoc Committees: The Ad Hoc Committee shall conduct business in relation to provisions established in Section 4. Board of Directors. Ad Hoc Committees are charged by the president to deal with specific issues within a limited or indeterminate timeframe. Consonant with guidelines as defined in Section 4. (7) and Section 3.2.A, members and chairs of Ad Hoc Committees will be appointed by the President. The Nominating Committee will be responsible for determining the availability of recommended candidates and for preparing the formalized slate of nominees that shall include officers, Board of Directors, and elected members of Standing Committees. The slate of nominees, with appropriate supporting documentation, will be distributed to the membership at least thirty (30) days prior to the annual meeting. The slate of nominees will be introduced at the annual meeting prior to the business meeting. Nominations from the floor during the business session will be in order, provided those members nominated have agreed and meet the qualifications to hold an elected position. The election will be conducted at the Annual Business Meeting. All election outcomes shall be determined by a majority vote of all eligible voting members (see section 2.1) who are in attendance. Those members attending the annual meeting who are unable to stay for the final business session may register with the Executive Director and vote by absentee ballot. The president will vote only in case of a tie. The slate for election will consist of no fewer than four (4) candidates for the position of member-at-large on the Board of Directors, no fewer than two (2) candidates for the position of Secretary, and one (1) candidate for President-Elect. The slate for election for the Nominating Committee will also consist of two (2) candidates. The Executive Director shall be the chief staff officer of the Council and shall have the primary duty to carry out the policies established by the Council and to operate the ICFAD office. The Executive Director shall be an ex-officio, non-voting member of the Executive Committee and Board of Directors. The Executive Director shall be appointed by the Board of Directors and shall serve at the pleasure of the Board of Directors. 8.1 FISCAL YEAR: The fiscal year shall be from January 1 to December 31. 8.2 MEMBERSHIP FEES: Membership fees for all membership categories shall be for the fiscal year and due on January 1 of each year. Changes in membership fees must be approved by a majority vote of the voting members. Notification of proposed changes in membership fees shall be provided to the general membership no later than thirty (30) days prior to the membership vote. 8.3 AUDIT: An external audit of the records of ICFAD shall be conducted within the first quarter after the close of each fiscal year. Bylaws may be amended by majority vote of the Institutional Member representatives. Proposed changes shall be provided to all members at least thirty (30) days prior to the scheduled vote. Ratified amendments will take effect upon ratification by the membership. Parliamentary authority for the organization shall be the current edition of Roberts Rules of Order Revised.